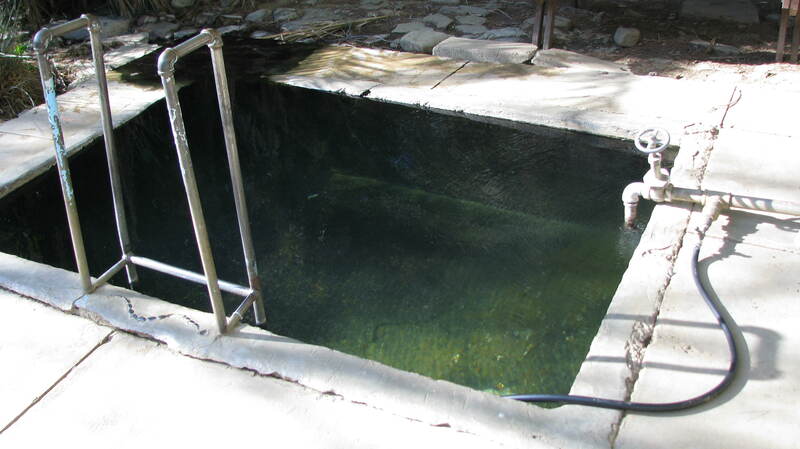 If you have not been back to the Agua Caliente Hot Springs it is one of the nicer ones in terms surrounding scenery. In fact I would have to say that this is my favorite “spa”. That is, I will often take a weekend (late fall to early spring is best because there are fewer people about) and go up there on a Saturday, day hike past the hot springs as far as I can and return just as it’s getting dark and have a relaxing soak under the stars. Then spend the night nearby at Middle Santa Ynez or P-Bar Flats car camping. The next morning get up and go for a short stroll along the Santa Ynez River where I almost invariably run into mule deer. 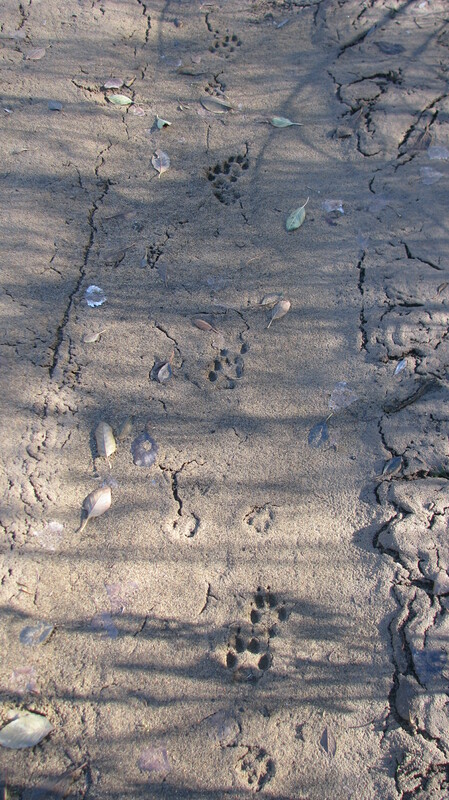 This stretch of the Santa Ynez river is also a great place to look for animal tracks, usually coyote, bobcat, mountain lion and bear. 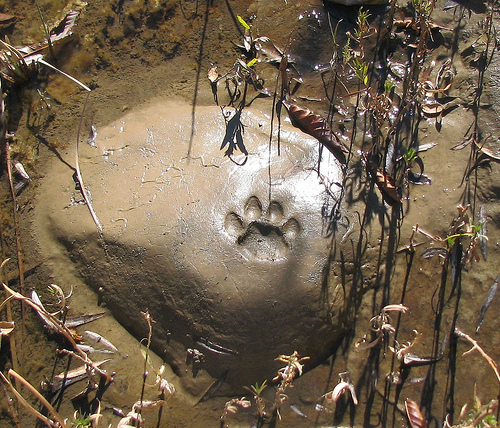 In fact in the wake of the Zaca Fire, with all the additional silt in the river it could easily qualify as a tracker’s paradise as I’ve seen and effortlessly followed tracks for 500 to 1000 feet. After breakfast, I’ll often spend the rest of the day exploring one of many trails that lead off of the Romero-Camuesa Road. To get to the Agua Caliente Hot Springs, one must first find a car that is willing to go as the second half of the journey involves a somewhat torturous dirt road. I used to take my Honda Civic with me until it would run and cower at the thought of being on that road again. It’s not that one necessarily needs a high clearance vehicle, but rather repeated trips will eventually wear out your suspension. Second you will need to check and see if the road is even open as the Forest Service often closes it during the rainy season. It is approximately 1.5 hours to the hot springs from downtown Santa Barbara. Starting at the Santa Barbara Mission for lack of better landmark, head north past the Mission on Mission Canyon Road to Foothill Road, make a right at the intersection and continue on Foothill until it joins Mountain Drive, make a left and continue. The big landmark here is the former water treatment plant. Make a left there, shortly thereafter there’s a weird 3 way branch in the road. You’ll want take the “middle” road, which then crosses El Cielito Road at which point it becomes Gibraltar Rd. Yes it’s a winding road. Along the way you’ll pass trail heads for West Fork Cold Springs and Rattlesnake Canyons as well as “Gibraltar Rock” where you’ll probably see several rock climbing enthusiast working its sandstone face. The road also provides impressive views of the burn areas for both the the Tea and Jesusita Fires. Eventually you’ll arrive at Camino Cielo were you’ll make a right. 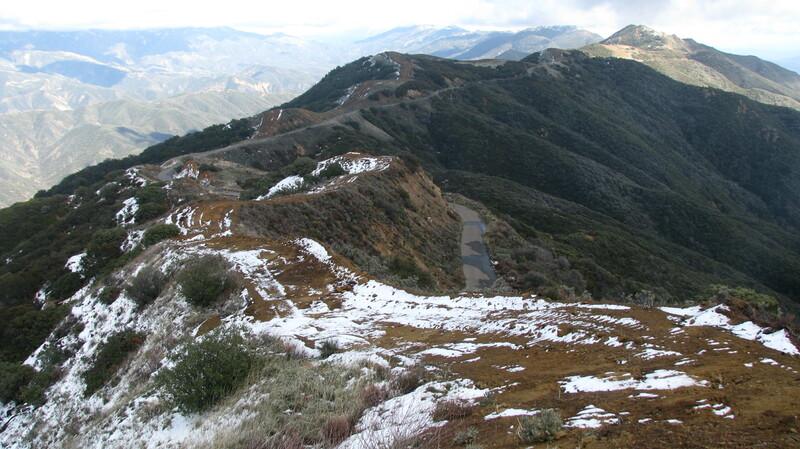 (continuing straight takes you past La Cumbre Peak and ultimately to Highway 154). If you have not been to Camino Cielo that in itself is a treat affording spectacular views of both Santa Barbara, Montecito, Carpinteria and the Channel Islands, as well as the Santa Ynez River Valley and the Sierra Madre Mountains. And in the winter there can even be a dusting of snow along these mountains. 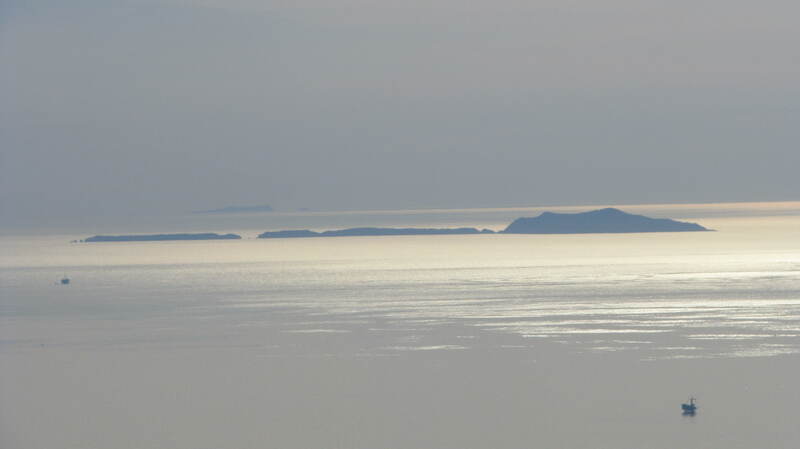 Camino Cielo translates as “Sky Road”. Pendola Rd. is that last leg of your journey, along the way you’ll pass “Rock” campground and arrive at Agua Caliente Hot Springs (where the road also dead ends). 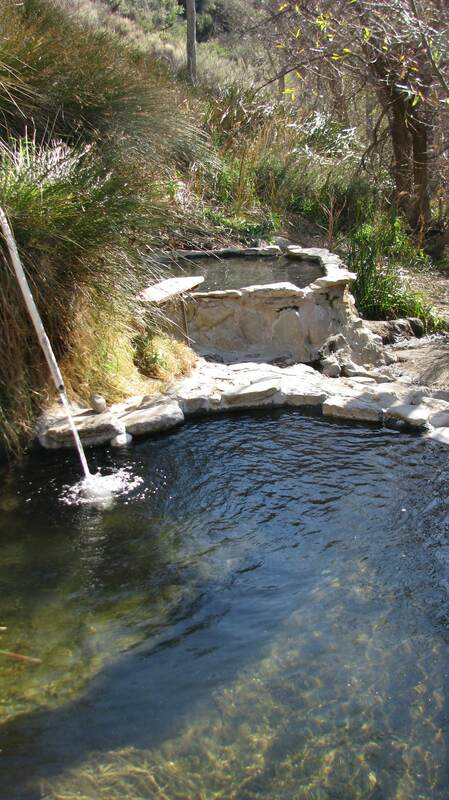 Agua Caliente actually boasts several hot springs. The large, obvious one nestled under the pine trees that seems to vary in temperature depending on a wide range of variables and two smaller pools a short ways up the trail that are usually hotter. It is also here that the Agua Caliente Trail begins where a nice swimhole can be found 2 miles in. These directions are so deliciously thorough. A group of about ten women and I are going in. Can you recommend one or the other of the campgrounds? We’d love to have a fire if there’s a pit. How far is the hike to the smaller pools from Middle Santa Ynez? And from Mono? I’m going to see what else I can find out about reservations at either. It’s a really special trip. I spoke with the forest service and the gate along the Romero-Camuesa Road is still closed and is not expected to open until mid-April. There are in fact two gates along the road, one about 5-10 minutes past where Camino Cielo (paved) transitions to the Romero-Camuesa Road (dirt) and another just past Middle Santa Ynez Campground. Both are typically closed mid to late January by the forest service in response to the rains. The first gate is often opened in April, but the second gate is sometimes not open until after Memorial Day. With the first gate open, for a group of 10, Middle Santa Ynez is your best bet as there’s plenty of room to spread out. There is a campground along the road to the hot springs called Rock, but it’s kind of small. I don’t recommend hiking to Agua Caliente from Middle Santa Ynez as it’s simply a long walk. There is no need to make reservations as all the sites back there are first come first served. All the campsites have fire pits and tables. In order to get to Mono and Little Caliente Hot Springs the second gate needs to be open. This is a slightly longer drive, but still worth it. Mono camp would also be big enough for 10 and although there is a road to Little Caliente, that walk is not that long from Mono and can be kind of pleasant. great place to visit, some have gotten stranded, myself loved the entire back country has stuck with me since 74, hoping for a return visit to gain some more memories @ both big and little caliente along with both Debris dams.